Microsoft Lync is transforming enterprise communications. 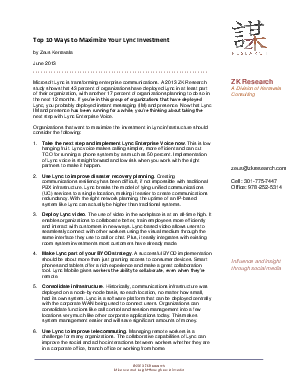 A 2013 ZK Research study shows that 43 percent of organizations have deployed Lync in at least part of their organization, with another 17 percent of organizations planning to do so in the next 12 months. If you’re in this group of organizations that have deployed Lync, you probably deployed instant messaging (IM) and presence. Now that Lync IM and presence has been running for a while, you’re thinking about taking the next step with Lync Enterprise Voice.